Simon & Schuster Books for Young Readers, 9781481469098, 40pp. In the tradition of Uni the Unicorn and Gaston, this heartwarming and adorable debut picture book tells the story of a young unicorn who was born under the sea to a family of narwhals. Growing up in the ocean, Kelp has always assumed that he was a narwhal like the rest of his family. Sure, he’s always been a little bit different—his tusk isn’t as long, he’s not as good of a swimmer, and he really doesn’t enjoy the cuisine. Then one night, an extra strong current sweeps Kelp to the surface, where he spots a mysterious creature that looks just like him! Kelp discovers that he and the creature are actually unicorns. The revelation leaves him torn: is he a land narwhal or a sea unicorn? But perhaps, if Kelp is clever, he may find a way to have the best of both worlds. 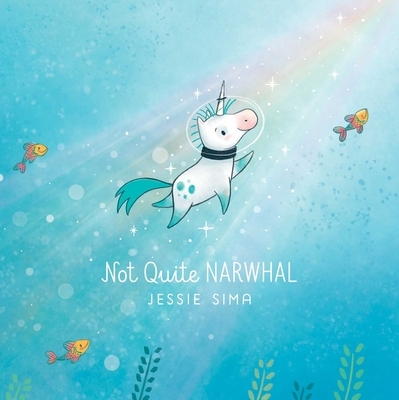 Told with heartwarming illustrations and spare, sweet text, Jessie Sima’s debut picture book is about fitting in, standing out, and the all-encompassing love of family. Jessie Sima is an author/illustrator living and working in New York City. She grew up in a small town in Southern New Jersey, unaware that she was a storyteller. Once she figured it out, she told her family and friends. They took it quite well. She is the author of Not Quite Narwhal; Harriet Gets Carried Away; Love, Z; and Spencer’s New Pet. You can visit her at JessieSima.com. "The message is an appealing one that could speak to many family situations relating to multiple identities...feel-good story"
"Adorable characters trigger smiles throughout"
"A storyteller’s pacing and winning characters, resulting in an appealing book. Read it for a whimsical storytime or provide some text-to-text connections for older students with Amy Krouse Rosenthal’s Uni the Unicorn and Bob Shea’s Unicorn Thinks He’s Pretty Great....this title is highly recommended." "Swap the tired Ugly Duckling for this delightfully absurd tale of knowing who you are and where you came from." "Sima’s bubbly, adorable artwork is nearly irresistible...This endearing tale will warm many a heart."